Durum is a variety of wheat that has a higher protein and gluten content than other kinds of wheat and that is most often found in pasta. Whole wheat of any variety is wheat that contains all three parts of the wheat grain -- germ, bran and endosperm. Whole wheat, whether durum or another variety, is more nutritious than its refined counterparts, because it contains the nutrient-rich germ and bran that are otherwise stripped away during the refining process..
Durum is the hardest of all wheat and has a higher protein and gluten content than other types of wheat, states the Wheat Foods Council. When durum wheat is milled, its endosperm is ground up into a product called semolina, which is then mixed with water into a thick dough that is forced through holes of different shapes to make different types of pasta. The naturally rich yellow color of the durum endosperm gives pasta its golden color. Grains that keep all three of parts of the original grain kernel -- germ, bran and endosperm -- in their original proportions after being milled into flour, are called whole grains, according to the Wheat Foods Council. They contain fiber, a type of carbohydrate associated with a lower risk of heart disease, and also retain their vitamin and mineral content better than refined grains. Thus, whole wheat flour and products made from it contain contain wheat germ and wheat bran as well as the endosperm. White flour, and products made from it, contain only the endosperm. Like any other type of wheat or other grain, durum wheat products likely are not made from the whole kernel unless the package says “100 percent whole-grain durum,” advises the U.S. Food and Drug Administration. 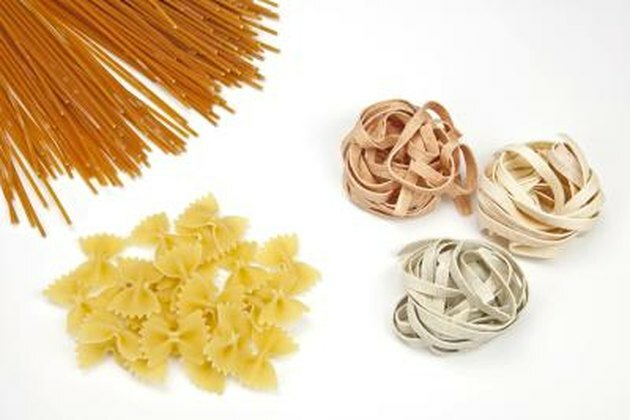 When using pasta products that contain some whole-grain durum but are not 100 percent whole grain, the relative amount of whole grain may be inferred from its placement on the ingredient label, states the U.S. Department of Agriculture. Ingredients are listed by amount present in descending order. The U.S. Department of Agriculture recommends that at least half of all grains consumed should be whole grains. Although most refined wheat is enriched with iron, thiamine, riboflavin, niacin and folic acid before being made into food, many of the vitamins removed are not returned and neither is any of the dietary fiber, which is essential for good health. There is some evidence that eating whole grains may reduce the risk of cardiovascular disease and may also be associated with lower body weight.